Climate change can have both direct and indirect effects on the natural environment. Rising (sea) temperatures or melting sea-ice can be seen as direct effects, whereas ecological systems including (human) behaviour can be affected indirectly. Polar regions show results of climate change at a much faster pace than other regions will (Berkes & Jolly, 2001, Hobbie et al., 2017). This makes the Arctic an ideal study environment for assessing effects of climate change, including the effects on (human) behaviour. However, before we can study the impact of climate change on the traditional way of life of humans, we first need to study climate change in the Arctic, the ‘traditional way of life’ and the animals related to this. The Arctic climate has two main patterns of circulation (Figure 1). In the positive phase, cold air is kept within the Arctic, which is favourable for sea ice formation and associated ecosystems (Thompson and Wallace, 1998). More recently the negative phase is getting increasingly common, leading to more snow in the mid-latitude North America, Europe and eastern Asia. With more cold air escaping the Arctic, the Arctic itself warms up and sea-ice retreats and the length of open water periods in the Beaufort and Chukchi Seas is increasing (Thomson et al, 2016). Figure 1: Different phases of the Arctic Oscillation, associated with different winds and storm tracks in the Arctic. Positive phase on the left, negative phase on the right. Courtesy of Dr. Dave Thomson, Colorado State University. The length of the melt season in the Arctic has increased approximately by one day every two years since 1979 (Stroeve et al, 2014, see also Markus et al 2009). As open water absorbs more solar radiation than ice cover, sea surface temperature (SST) in the Arctic has increased by 0.5-1.5?C over the last decade (see also the Temperature sub-challenges), leading to delays in the timing of freeze-up initiation (Markus et al, 2009). This has resulted in changes in the overall ice thickness of Arctic sea ice (Animations of changing sea ice export and ice thickness are available from NASA Goddard's Scientific Visualization Studio: https://www.nasa.gov/feature/goddard/2016/arctic-sea-ice-is-losing-its-bulwark-against-warming-summers). Timing of migratory species has changed with the sea ice, e.g. the autumn migration of Beluga whales has delayed an average of 4 days/year, based on data from 2008-2014 (Hauser et al, 2016). The ‘traditional way of life’ can be linked to indigenous people, keeping to traditions set many generations ago, often making use of subsistence herding, gathering, hunting or fishing. During the last century, Arctic regions have modernized enormously. For example, in Greenland subsistence hunting and fishing is still widespread, but it has increasingly become a leisure activity in comparison to a ‘way of life’ (Curtis et al. 2005). A similar change can be found in Northern Siberia (Koptseva & Kirko, 2014), Alaska (Moerlein & Carothers, 2012), as well as in the far north of Canada (Berkes & Jolly, 2001; Searles, 2008), where supermarkets and imported foods now add to the diet collected by traditional gathering and hunting (Lougheed, 2010). For this study, no distinction is made between people fully depending on a subsistence way of life, partly depending on it, or not depending on it but still using it for traditional or other purposes. Because of modernization, social, economic, and demographic change, as well as resource development, trade barriers and animal-rights movements, there have been many changes in human behaviour with regards to the ‘traditional way of life’ (Nuttall et al., 2005). It is hard to filter out which change led to which effect, as many of the changes link together and influence each other. Climate change can affect species used for subsistence, but it also affects the means of gathering them. For example, summer sea-ice retreat can lead to a smaller hunting area, extreme weather can damage village infrastructure, melting permafrost can lead to altered spring run-off patterns and changing sea levels and tidal fluctuations can pose dangerous fishing conditions. Unpredictable weather due to climate change has impact on many aspects, as shown in Figure 3. The impact of climate change on traditional life is not always linear, it can be a complex network of relationships and effects, each in turn connected to many other aspects. For example, due to the rapid changes in climate, elders are unable to predict weather compared to their former knowledge and experience, and they cannot pass this knowledge on to the next generation. Lower predictive skill means increased risks of failure or accidents during hunting, migration, food collection and camp formation. Loss of these traditional skills changes the way of life rapidly. Efforts to map traditional knowledge in peer reviewed scientific studies have been limited in success due to the difference in the types of information: historical knowledge and experience vs. experimental or observational studies. Figure 3: Observation, impact & adaptation diagram for Canadian Inuit regions on unpredictable weather. Source: Nickels et al. 2005. Fish is the most reliable subsistence resource in Alaska (Moerlein & Carothers, 2012). In several communities in north-western Alaska the catch contains chum salmon (Oncorhynchus keta), dolly varden (Salvelinus malma) and several species of whitefish (Moerlein & Carothers, 2012). Fishing and hunting practices are extremely flexible in response to changing conditions and needs (Moerlein & Carothers, 2012). Musk-ox (Ovibos moschatus), lesser snow goose (Anser caerulescens), ringed seal (Phoca hispida), and various fish species are the main species for hunting of a community in the Canadian Arctic (Berkes & Jolly, 2001). During winter, people hunt musk-ox and, to a lesser extent, caribou (Rangifer tarandus), arctic foxes (Alopex lagopus), wolves (Canis lupus), polar bears (Ursus maritimus), and ringed seals (Pusa hispida). The study provides a list of examples of local environmental changes and effects on subsistence activity described by members of the community. This includes impacts on access, safety, predictability and species availability. For example, old ice doesn't come in close to the settlement in summer anymore which makes it more difficult to hunt seals; open sea-ice in winter makes travel dangerous; the arrival of spring differs from year to year; and more rain in the fall increases chances of freezing rain, which can lead to caribou starving. The effects of these changes and the response strategies of the affected people vary. Because of modernization most communities have a wider range of food options now, making it less vital for a direct need to adept to the environmental changes. Response strategies on a short-term such as use of other vehicles for travel, changing hunting areas or waiting for the appropriate timing are applied (Berkes & Jolly, 2001). Long-term adaption strategies are only speculated. Climate change may not always have a negative effect. For example, with seawater temperatures rising marine fishes of a more temperate origin move northward into the Arctic seas (Christiansen, Mecklenburg, & Karamushko, 2014). Two species of Pacific salmon were welcomed by local inhabitants. A combination of modernization, globalization and climate change has affected subsistence living conditions in Upernavik in northern Greenland (Hendriksen & Jørgensen, 2015). Since the 1980s Greenland halibut fishing in dinghies has been a major source of income for the local community in summer. Dangerous situations arise when the shorter period of sea-ice forces fishing to be carried out in the dark winter period as well. The same accounts for hunting of whales and seals. Local communities have been rather resilient and adaptive in meeting the challenges set by climate change, due to their traditional and local knowledge (Hendriksen & Jørgensen, 2015). They point out that governance (such as restrictions in hunting or fishing methods or set quotas) is even more challenging than the changes in their natural environment; it is not only climate change which threatens the traditional way of life. Caribou (Rangifer tarandus) are a species of deer native to the Arctic environment. 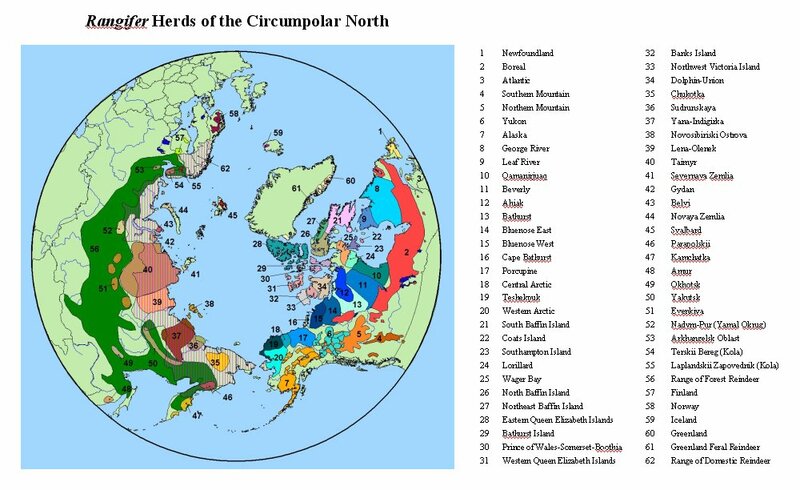 There are many subspecies within the circumpolar distribution (see Figure 4). Some of the populations are sedentary while others are typically migratory. Caribou are unique ruminants, feeding mainly on lichens and some senescent browse in wintertime (Parker et al. 2005). An interactive map with caribou habitats can be found here: http://carma.caff.is/carma-interactive-map. Figure 4: Circumpolar distribution of reindeer and caribou with associated population names. Source: CARMA https://www.caff.is/images/_Organized/CARMA/Welcome_to_CARMA/Map/Circumpolar%20herds.jpg accessed on April 25th, 2017). The species Rangifer tarandus is called ‘reindeer’ in Europe and Asia and ‘caribou’ in North America. However, there seems to be genetic diversity between the two, with two original lineages: one originating from and confined to Northeastern America, the other originating from Euro-Beringia but also currently distributed in western North America (Yannic et al. 2013). For this report however, no distinction is made between the two and Rangifer tarandus is used for both caribou and reindeer and ‘caribou’ is used to indicate Rangifer tarandus. Climate change can impact caribou in many ways. For example through changes in habitat and food accessibility, and in temperature, see Table 1 (source: CARMA, CircumArctic Rangifer Monitoring and Assessment Network, accessed on April 11, 2017). In very general terms the calving range improves but movement and reliance on more northern portions of the calving range; animals leave calving range earlier; cows and calves suffer reduced summer and fall body reserves due to increase in oestrid fly harassment; mosquito harassment may be reduced if summers are drier; more frequent icing on fall, winter and spring ranges which, depending on the location of these ranges may have moderate to severe implications to body condition and survival. In relation to management, there will be an overall need to assess habitat protection in relation to climate trends, need to factor climate change impacts on harvest strategy, need to communicate impacts of climate on harvest patterns and timing and a need to set up comprehensive monitoring programs. Behaviour of two herds of caribou in Canada is described as: “Migratory caribou appeared to prefer regions with higher snowfall and lichen availability in the fall and winter. In the summer, caribou preferred cooler areas likely corresponding to a lower prevalence of insects, and they avoided disturbed and recently burnt areas (Sharma et al. (2009).” Models were used to indicate possible responses of these herds to climate change. The results are variable, as responses depend on the current migratory pattern and habitats and the possible effect of climate change in this. This limits the range of one herd but increases the range of the other, limiting both to a certain region (Sharma et al. 2009). Caribou are an important source of food in the traditional way of life all over the Arctic. Impacts of climate change on the traditional way of life can include the loss of possible hunting areas or herds either in certain periods of time or permanently, as well as the other way around. Freezing rain in fall can lead to caribou starvation which would lead to a lower prey availability for subsistence hunting (Berkes & Jolly, 2001). On the contrary, increased availability of summer forage and more wind as favourable conditions may lead to a higher prey availability. Traditional knowledge gives subsistence hunters flexibility in dealing with climate change (Pearce et al., 2015). For example, knowledge of caribou husbandry but also knowledge on how to deal with and prepare for hazardous hunting conditions can give the hunters footholds when conditions change. In conclusion, climate change has a direct effect on caribou behaviour which in turn influences the traditional way of life. However, effects of climate change on caribou are variable, resulting in both positive and negative effects for subsistence hunters. The effects depend on (among others) location and normal migration behaviour of the caribou, season, and (traditional) knowledge and flexibility of the hunters. Bowhead whales (Balaena mysticetus) typically live in the Arctic and are divided in four stocks: Bering-Chukchi-Beaufort Seas (US (Alaska), Canada, and Russian Federation); eastern Canada – west Greenland (Canada and Denmark (Greenland)); Svalbard-Barents Sea (Spitsbergen) (Denmark (Greenland), Norway, and Russian Federation); and the Okhotsk Sea (Russian Federation and Japan) (COSEWIC, 2009; Reilly et al. 2012). The eastern Canada – west Greenland stock was previously thought to be two separate stocks (Hudson Bay-Foxe Basin; Davis Strait-Baffin Bay), however new research showed they belong to the same stock (COSEWIC, 2009; Wiig et al. 2009). Figure 5: Four different stocks of the Bowhead Whale. 1. Okhotsk Sea, 2. Bering–Chukchi–Beaufort seas (BCB DU), 3. Eastern Canada – West Greenland (EC–WG DU), 4. Svalbard/Barents Sea. Question marks denote the Labrador coast where Inuit are historically reported to have harvested Bowheads. Basque whalers hunted Bowheads in the Strait of Belle Isle (C). Floating or stranded Bowhead carcasses were observed at Rattling Brook (B) in 1998 and Mobile Point (A) in 2005. Source: COSEWIC, 2009. During summertime bowhead whales migrate to the high Arctic and they retreat to the sea-ice edges during wintertime (Reilly et al. 2012). Bowhead whales are very large animals with body lengths of over 19 meter and a body mass of over 80 metric ton (George et al. 2015). Despite their size, bowhead whales feed mostly on zooplankton in the form of medium-sized crustaceans such as krill and copepods (Reilly et al. 2012). All bowhead whale stocks have been severely overexploited during the commercial whaling periods of the 18th and 19th century. Since the end of the large-scale commercial whaling the stocks are slowly recovering. The Bering-Chukchi-Beaufort Seas (BCB) stock is thought to be close to pre-whaling levels, but the Atlantic stocks recover more slowly and are still at relatively low levels (Fauchald et al. 2017). As bowhead whales are a typical ice-associated migratory species, climate change could have a direct effect on them. The bowhead’s food, zooplankton, is closely coupled to the primary production, which in turn is directly influenced by climate change (see also the sub-challenge ‘phytoplankton’) (George et al. 2015). However, bowhead whales are not directly dependent on the presence of sea-ice but more on the presence of zooplankton, which may also be present in open water. The reduction of sea-ice could even have a positive influence on the amount of available prey for the bowhead whale through an increase in primary production (George et al. 2015; Moore & Huntington, 2008; Moore & Laidre, 2006). Bowhead whales have been part of subsistence hunting for thousands of years (Ashjian et al. 2010; Seersholm et al. 2016; Suydam & George, 2004). Current subsistence hunting on bowhead whales is regulated through strict quotas to not impede further stock recovery (Fauchald et al. 2017). Subsistence whaling in the BCB stock (Alaska) can be taken as an example. The (rough) migratory pattern of this stock is depicted in Figure 6 (George et al. 2015). During the spring and fall migrations the local communities of Northern Alaska hunt the bowhead whales to provide subsistence food (Ashjian et al. 2010). The presence of bowhead whales is mostly dependent on readily available food sources (zooplankton) which can be directly seen in its distribution. Figure 6: Seasonal range map of the Bering–Chukchi–Beaufort bowhead whales based on satellite telemetry data (Quakenbush et al., 2012). Bowheads are also known to occur in regions outside these general boundaries. Source: George et al. 2015.
the existence of mechanisms that aggregate euphausiids into dense prey patches. All the factors link to each other and are affected by climate change effects. Certain wind conditions have influence on the upwelling and aggregation of euphausiids. This creates favourable conditions for bowhead whales and consequently for subsistence hunters. When weather and wind patterns change due to climate change, migration patterns could be altered and subsistence hunting could be affected (Ashjian et al. 2010). Considerable inter annual variation is seen in migration and summer locations of bowheads, possibly due to shifting environmental conditions (Fauchald et al. 2017). Bowhead whales arrive earlier and hunting starts earlier in spring and later in autumn (Huntington et al. 2016). Less multiyear sea-ice and thinner land-ice has made it harder to find ice floats for hauling out whales for butchering in spring. Whales no longer appear to feed along the edge of the land-ice southwest of Barrow in spring (Huntington et al. 2016). The latter seems to pose a bigger problem for the native subsistence hunters than the changing migratory patterns, as the traditional bowhead hunts rely on the presence of sea-ice (Sakakibara, 2017). In conclusion, climate change has an effect on Bowhead whales’ migration behaviour which in turn influences the traditional way of life. However, as the bowhead whale hunt is influenced by other factors as well, some of them also dependent on climate change, there is not always a direct relationship. To provide a more in depth answer on the availability and quality of data, a more narrow and specified question is needed. For now, two species were chosen to illustrate the effects of climate change on animal behaviour and the traditional way of life. On the (migratory)behaviour of caribou and bowhead whales information can be found mainly in scientific papers published in peer-reviewed journals. Because climate change can have effects on species’ behaviour in various ways with various outcomes it is difficult to build databases for this topic. However, information on the (migratory) behaviour of specific populations or stocks of animals used for the traditional way of life and the influence of climate change on this can’t be found in a single database or data source. While it is complicated to monitor the effects of climate change on the traditional way of life, it is possible to monitor species’ migrations and/or behaviour in areas in which climate change is visible. Climate change impacts the traditional way of life. This may be a consequence of the effect of climate change on animal behaviour such as migration routes. However, people still actively pursuing the traditional way of life in the Arctic seem to be very adaptive to changing conditions. For example, Inuit in the Canadian Arctic are very flexible, showing responses to varying climatic conditions (Figure 7, Pearce et al. (2015). Figure 7: Photographs of Inuit in the Canadian Arctic illustrating responses to changing climatic conditions that affect subsistence. (Left): Flexibility – Iqaluit hunters improvise, using boats to maintain access to seal hunting areas in late fall. (Centre): Hazard avoidance – Ulukhaktok hunters make extra efforts to read weather and ice conditions before and during travel. (Right): Emergency preparedness – Knowledge of how to build an emergency snow house enables hunters to wait out storm events. Source: Pearce et al. 2015. A similar optimism can be found for sustaining subsistence systems, pointing at the long history of subsistence systems and its apparent resilience (Kofinas et al., 2010). However, changing climatic conditions may prove to be too problematic for certain types of traditional hunting as simple things like access to the food source may cause a significant reduction in the availability of subsistence resources in the future (Brinkman et al. 2016). Climate change is not the only thing affecting the traditional way of life: globalization, westernization and modernization are only some of the other factors influencing the traditional way of life. Effects of climate change on the habitat and (migratory) behaviour of specific populations or stocks used for subsistence reasons. The results of the monitoring should be openly available in a public database. Reilly, S.B., Bannister, J.L., Best, P.B., Brown, M., Brownell Jr., R.L., Butterworth, D.S., Clapham, P.J., Cooke, J., Donovan, G., Urbán, J. & Zerbini, A.N. 2012. Balaena mysticetus. The IUCN Red List of Threatened Species 2012: e.T2467A17879018. http://dx.doi.org/10.2305/IUCN.UK.2012.RLTS.T2467A17879018.en. Downloaded on 11 April 2017.